The artist, until at least 1954. Herbert Agoos, Cambridge, MA; sale, Sotheby's, London, 4 July 1979, lot 127. Acquired at the above sale by Christian Fischbacher. Lund Humphries, ed., Ben Nicholson, paintings, reliefs, drawings, vol. I, London, 1955, p. 10, no. 199 (illustrated). London, The Arts Council of Great Britain, British Paintings, 1951, no. 63. Canada, Touring Exhibition Organised by the British Council of Fine Arts, Contemporary Painting, 1952 - 1953, no. 25. London, Guildhall, Trends in British Art, 1954. 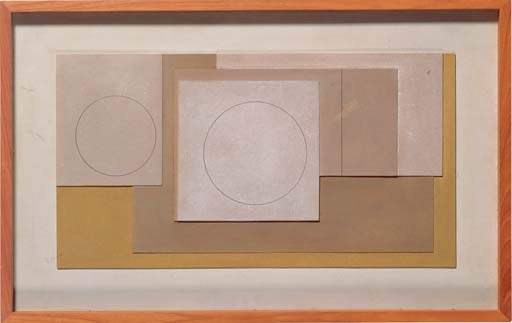 The present work is an example of a carved relief, the approach to abstraction for which Ben Nicholson is perhaps best remembered. His first relief was made in Paris in December 1933. Nicholson expressed his excitement over his new discovery in a letter to Barbara Hepworth on 12 December: 'I did a very amusing thing yesterday. I carved it all day long it is about the size of a sheet of notepaper & looks like a primitive game' (quoted in exh. cat., Ben Nicholson, Tate Gallery, London, 1993, p. 216). Early influences in Paris at the time include Miró, in particular an abstract by the Spanish artist which was the 'first free painting' Nicholson had seen. The present work dates to 1946, by which time Nicholson had left London, with Barbara Hepworth and their young triplets, to settle in the remote fishing village of St. Ives in Cornwall. The imminent outbreak of war had precipitated their move, and Nicholson's preoccupation with his new natural environment greatly influenced his art at that time. A panoramic view of the rugged expansive Cornish landscape in winter, Nicholson's favourite time of year, is suggested in the present work's horizontal composition of white and brown surfaces of carved board. The inscription on the reverse, 'zennor landscape', refers to the area around the ancient Cornish village of Zennor, particularly known for its prehistoric burial chamber, Zennor Quoit, which consists of seven upright stones and an original capstone which now rests against the chamber. Nicholson's fascination with this example of megalithic architecture, reflected in the slab-like forms in the present composition, was to have a lasting impact. He revisited this theme twenty years later in 1966 (Zennor Quoit 2) (Phillips Collection, Washington, D.C.). The overlapping of circular and rectangular forms in the present work creates shadows as architecture would on a landscape, reflecting the belief that Nicholson shared with Picasso that abstract art has its roots in reality, and therefore could not be considered abstract in the purest sense, as he commented in a letter to Herbert Read: 'I like the actual shadows cast in the reliefs among the illusions of shadows but I like them cast from the same angle as those that I've experienced by sun & moon light. I don't want a disembodied idea but one with grass roots!' (quoted in ibid., p. 223). He further explained his preoccupation with architecture and how that informed his artistic vision in a letter to Patrick Heron dated 9 February 1954: 'I have always been interested in the sculptural-architectural approach & any 'decorative' element in a ptg is something meaningless to me. But I do not look for massive form...there is excitement for me in chiseling out flat planes - or in chiseling out by a single line...a whole elaborate form...In dealing with spaces I like a series of flat planes which interchange their position in depth...I hope in depth & never on the single plane of the surface. One does not live on a single plane & so there is no reality in a single plane in a ptg' (quoted in ibid., p. 75).